Festival Entertainment. Strolling and stage festival performer. Fun filled festival entertainment to delight young and old alike! Professor Whizzpop is an "all in one medley of fun" at a festival. 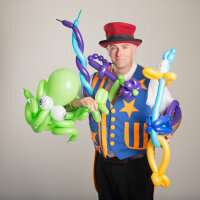 You can book highly interactive strolling entertainment such as magic, giant bubbles and juggling or amazing festival balloon art. You can have a fun filled 45 minute show on your children's stage, strolling magic, a traditional magic street show direct from Olde England or the brand new Whizzpop's Fantastic Flea Circus... and of course the laughs, audience participation and amazing performances are guaranteed to delight your festival attendees! Professor Whizzpop has performed at Lazy Daze Cary, Lake Eden Arts Festival, North Charleston Arts Festival, Bele Chere Asheville, UNCG Homecoming Festival, Cherokee Trout Festival, Church Street Festival Asheville, Wake Forest Octoberfest, UNC Pembroke Very Special Arts Festival, Spring Days Cary, Folkmoot, SC International Festival, Downtown Spartanburg Dickens of a Christmas... among many more!